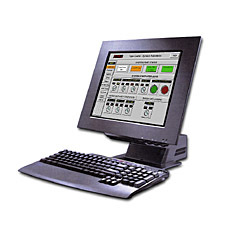 This system features UNIQUE/PERENY’s non-proprietary software specifically designed to integrate kiln control providing a high level of automation and ease of use. An industrial PC with touch screen serves as the primary operator interface to the kiln. The PLC (Programmable Logic Controller) uses discrete and analog I/O modules for control of the kiln independently of the PC. TCP/IP Ethernet communication serves as the network interface between the PC and PLC and provides simple integration into existing or future plant systems. The PC is also equipped with a modem for remote monitoring and trouble shooting of the kiln control system. General Electric 90/30-Ethernet processor with I/O modules and base mount rack capable of expansion. Microsoft Windows 2000 professional operating environment. General Electric Cimplicity HMI run time system. System Overview graphically displays the kiln, the operating status, and critical process values. System Interlocks screen provides operator access to kiln start/stop functions. Individual Set Point and PID controller screens for each control zone. Real Time Trend screens are provided for instantaneous readout of critical process values. Historical Trend screens provide access to process values which have been selected for data logging. System Alarms screens display the current alarm status and allow review of alarm history.